I used the PTU kit called DARK SIDE OF EMO by Crystal's Creations, which you can get to HERE. 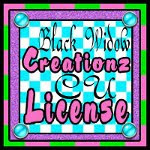 I used 2 FTU tubes by the talented Zindy Nielson, which you can find HERE along with an assortment of other products you're bound to like :) using her free tubes, you still must use a license number. Let's get started on the banner. 1. Open a new image. Size 600 x 250. LAYER>TRANSPARENCY>COLOR TO ALPHA to make background transparent. 2. Add a new layer. Right click and Alpha to Selection. Use fill tool and fill with black. SELECT>SHRINK by 6. EDIT>CLEAR. SELECT>NONE. 3. Add another new layer. Fill with a light grey color. Repeat all instructions in step #2 but shrink by 7 instead of 6. Add noise to this layer- FILTERS>NOISE>RGB NOISE settings at 20/20/20/0 keep this layer below the black frame layer in layers box. Merge the black frame layer and this grey frame layer. 4. Open as new layer paper 9 in kit. Set this layer at bottom of layers box. 5. Open as new layer element 40 from kit. Set on bottom right corner... duplicate and flip the copy and place in upper left corner. 7. Use the text tool to create a new layer. I used the font called UNDECAPPED VINYL in size 75. I found a shade of greyish blue that I thought was good. Right click this layer and choose Alpha to Selection. Then add a new layer. Fill the new layer with black. Write your text of choice. We'll come back to this layer later to animate it. But if you don't want to animate it, you can just add noise to the layer now. 9. I used the tube PRETTY HURTS TOO and moved the opacity slider to 20. Place this behind the layer you made in step #6. The other tube is called JUST A LITTLE BLUE. Place it accordingly, and above the first layer you made in step 8. 10. Open as new layer element 30 from kit. Scale to 132 x 123 and add drop shadow. 11. Right click on the black and grey frame you made in step #3. Choose Alpha to Selection. Go to IMAGE>CROP TO SELECTION. 12. Add the copyright info to your tag. Copyright symbol, name of artist and artist's website, as well as any license numbers you may have. 13. Save your tag as a .xcf right now. That way if you mess up, you can come back and make changes again. If you choose to go on without the animation, you can save as .png but let's keep going and get that animated. 14. Scroll to the top of the layers box. Begin merging layers, one by one. You want to stop merging before you get to the text layer in step #7. Do not merge the greyish blue text layer. Click on the black text layer and keep merging down until you have 3 layers like the picture below. Then duplicate each layer twice- so that there are 3 layers of each... A total of 9 layers in the layer box. Rearrange them so they are like the picture below. Right click on the text layer. I start from the top- copy #2 and work down. Choose Alpha to Selection. Go to FILTERS>NOISE>RGB NOISE settings at 20/20/20/0. Keep the selection and click on the next text layer- #1 and go to FILTERS>REPEAT RGB NOISE. Click on the original text layer and FILTERS>REPEAT RGB NOISE. Then you can go to SELECT>NONE. Now merge those layers again. Drop shadow copy#1 merge to text layer merged with Background copy#1 then repeat with drop shadow copy, text copy, background copy and repeat once more with drop shadow, text, background. You will end up with 3 layers. Like pic below. 15. Right click on the first layer and then go to IMAGE>MODE>INDEXED. In the drop down, select Floyd-Steinberg (reduced color bleeding) and check the box that says Enable dithering. 16. Make sure that your background color is white. Then right click on each layer, selecting each time- REMOVE ALPHA CHANNEL. 17. FILE>SAVE AS filename.gif A box will come up. Choose SAVE AS ANIMATION. Hit EXPORT. If a box comes up and says to crop, go ahead and crop. Another box will come up. In this box you want LOOP FOREVER & USE DELAY ENTERED ABOVE FOR ALL FRAMES checked. And you will want 100 milliseconds and I DON'T CARE entered also. Hit save. 18. If you want to see what you have made, you can go to FILTERS>ANIMATION>PLAYBACK. If you don't have something right, if it doesn't run thru this animation smootly, you can go back and make changes. Sometimes it takes a few tries but you can do it. For the avatar, you only have a couple changes to make. 1. Right click on the black/grey frame you made and scale to 200 x 200 (have to unchain). Place it over the left corner. 2. Scale element 30 to 65 x 61. Delete original drop shadow that was with it. Then add a new one. 3. Rotate element 10 then move it accordingly. Delete original drop shadow and add new one. 4. Size of initial is 157. Grow and fill just like in banner. 5. Erase any layers not showing in this area. Then Click on the frame layer to make it active. Then go to IMAGE>CROP TO SELECTION. 6. Save as a .xcf then repeat steps #14- #18 from making the banner.